India has close to 4,000 management schools that produce over 300,000 graduates every year. But the country has less than 25 niche management schools focusing on the rural sector and most of them are government-run. Tholapalli is a typical Indian hamlet which lies in the heart of Karnataka's malaria belt. Floriculture is the major occupation of a dozen-odd households in the village about 126 km from Bangalore and life there is normally calm. But, last summer, the tranquillity was disturbed a bit when some students from the Institute of Rural Management Anand (IRMA) spent two months with Tholapalli villagers in an effort to understand the reality of village life. The students stayed with village families, ate local food such as ragi balls with sambhar, slept in a community hall and many a night had snakes for company. The exercise - called the village field work segment - was part of a two-year post graduate programme in rural management. "The stay helped us understand the psyche of the villagers. It dawned on us that most rural problems cannot be solved using a top-down approach," says Utsav Agarwal, a second-year student. The students learned other lessons from their stay in Tholapalli. "Villagers are very smart. They do not waste anything. For everything they do, there is an underlying reason which is not taught in a book or classroom. We need to understand that to take the right decision," says Divya Bhatt, another IRMA student. Agarwal and Bhatt are among a small fraction of management students who have chosen to follow their heart and study rural management instead of joining more glamorous mainstream management schools. India has close to 4,000 management schools that produce over 300,000 graduates every year. But the country has less than 25 niche management schools focusing on the rural sector and most of them are government-run. Rural management schools produce less than 1,000 quality rural managers. The small number is surprising considering the importance of the rural sector, or Bharat, in India's economy. According to a study by global consulting firm Accenture, the rural economy accounts for 50 per cent of the country's gross domestic product. It also makes up 70 per cent of the country's population and 50 per cent of the work force. About 75 percent of new factories built in the past decade have come up in rural India, which accounts for 75 per cent of all new manufacturing jobs. Since 2000, per capita GDP has grown at 6.2 per cent a year in rural India compared with 4.2 per cent in urban areas. And in terms of spending, Bharat has trumped India by a mile. Between 2009 and 2012, Indians in the countryside spent $69 billion compared with $55 billion in big towns and cities. Harish Manwani, chairman of Hindustan Unilever Ltd, says rural India is a powerhouse with the potential to add $1.8 trillion, or the equivalent of the current GDP, to the country's economy. But this potential can be realised only if Bharat and India merge. His prescription: "We need to build a new generation of leaders and entrepreneurs from our villages who will help power the future of our nation," he told shareholders at the HUL annual general meeting last year. India needs rural managers for another reason. The shortage of trained rural managers is forcing people with degrees in social work and related fields to take on such jobs. "Such candidates are not suited for rural management. They are welfare-oriented and what we need are people who trigger income-generating activities," says Jeemol Unni, Director, IRMA. "The country has adopted a 'rights' approach to development such as Right to Food, Right to education and so on. This calls for more rural managers." IRMA, started by India's 'Milk Man' Verghese Kurien, has been one of the few institutions at the forefront of professionalising rural management for the last 30 years. Its two-year post graduate programme in rural management is sought after and 120 students graduate from the school every year. It had a 100 per cent placement record last year, with average offers of Rs 7.09 lakh a year. The highest offer was Rs 13 lakh. IRMA is not alone. The Jaipur-based National Institute of Agricultural Marketing (NIAM) is another leading school that focuses on agricultural marketing. It isn't unusual to see a group of students from the agricultural marketing school at Jaipur's wholesale fruit and vegetable market early mornings observing an auction. Students also study ways of increasing the bargaining power of farmers. NIAM had a 100 per cent placement rate, with a top salary of Rs 12 lakh and an average payout of Rs 6 lakh. "Most farmers in India do not have the selling power, they lack price information and logistics which impair their decision-making," says Hema Yadav, Deputy Director, Post Graduate Diploma in Agri Business Management offered by NIAM. "Our objective is to build that capacity by developing managers who understand the issues involved on the ground." Hyderabad's National Institute of Agricultural Extension Management (MANAGE) was the first institution in India to start an agricultural business management course in 1996. It emphasises field work and most of its students are from rural backgrounds. Its students have for years seen 100 per cent placement and the top salary offered last year was Rs 18 lakh. "Our objective is to prepare students who will go out and turn subsistence farming, that we predominantly have today, into commercial farming," says Anand Reddy, principal co-ordinator, PGDABM, MANAGE. 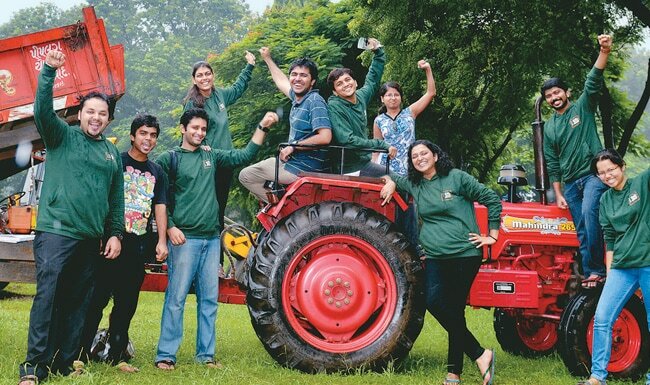 If the Jaipur and Hyderabad schools focus on agriculture, Pune's Vaikunth Mehta National Institute of Co-operative Management (VAMNICOM) focuses on co-operatives. It aims to professionalise management of co-operatives in India where many of the 500,000 co-operatives are run with little professional skills. "Farmers cannot do everything - sourcing inputs, production, value addition, marketing and quality assessment," says Sanjeeb Patjoshi, Director of the Pune school. "Co-operatives have ensured that a farmer gets good inputs, including credit, help in marketing and value-addition, apart from assessing quality." Mainstream management schools have not ventured into rural management for many reasons. "These courses are very niche and they call for students with a different set of attitudes. The teaching approach is also different. Most mainstream schools may not be prepared to handle such subjects," says Professor Abraham Koshy, professor of marketing at the Indian Institute of Management, Ahmedabad. Experts say there is room for more rural management schools. "For a country of India's size and the number of problems we face, there is a need for lot more such institutions. We have IIMs in places like Kashipur and Rohtak, but they cannot deliver rural exposure that institutes like IRMA and others offer. What we need is more rural sector focused management schools there,"says Hari K. Nagarajan, professor and RBI chair in rural economics at IRMA. "We need to create a lot of rural managers who are potential agents of change. "